A super promotional item for healthcare and beauty campaigns. 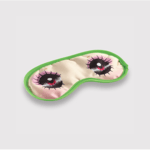 These promotional eye masks can be branded with your logo and are available in several styles and colours. Where can you brand an eye mask? The most common branding area is onto the body of the eye mask itself. The imprint position and area will be shown on the individual product. Please contact us if you need a larger or alternative print area for your logo and details. What is an example of a campaign using branded eye masks? A typical example would be use of branded eye masks in the travel or tourism industry. Airlines may use eye masks are part of their comfort packs for long haul passengers. Some people do actually keep the eye masks for later journeys, extending the amount of exposure for the brand. Can eye masks be chilled? The gel filled eye masks can be chilled to be used as part of beauty therapy. Please make sure you follow the instructions for use and do not over-freeze the eye masks.